WordPress is truly a robust platform. 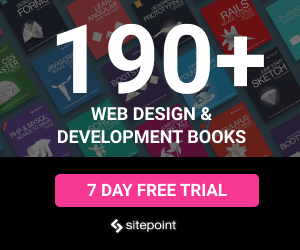 Even though it’s mostly used as a CMS, WordPress can easily be transformed into a full-featured shop. You can integrate a shop into your blog or set up an ecommerce store using WordPress as a foundation – the sky’s the limit. If you’re a store owner, chances are you’re selling a downloadable product or two. 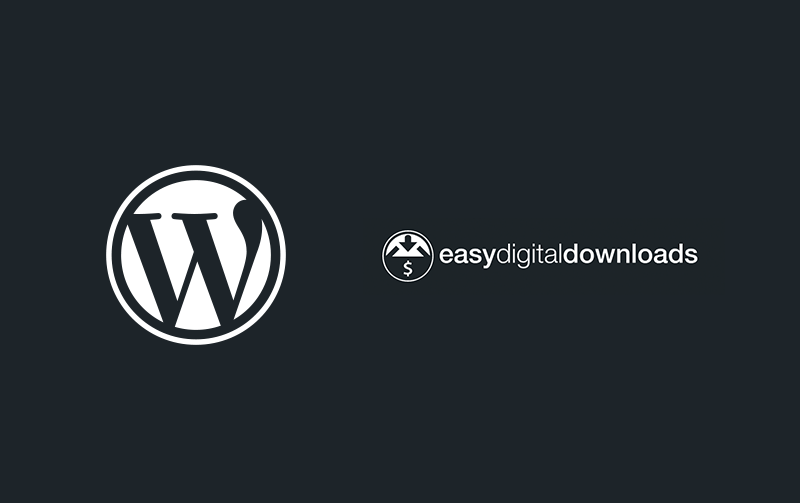 With WordPress, selling downloads is easy thanks to the aptly named Easy Digital Downloads (EDD). EDD is one of the most widely used plugins for selling downloads, and it certainly lives up to its name. As a free plugin, it has incredibly versatile functionalities, and it’s a breeze to set up. In this article, we’ll delve into the features that Easy Digital Downloads provides and walk you through the exact process to set up your first download and integrate the plugin with your site. Will Easy Digital Downloads Work with Your Theme? The FAQ page on the Easy Digital Downloads site states that the plugin is designed to work with any theme. That said, some themes are more compatible than others. Many themes are designed with the plugin in mind, and these themes will offer the highest degree of compatibility. While these themes aren’t required, they allow for a more seamless experience. You can browse EDD-compatible themes on the Easy Digital Downloads site or on Themeforest. First, you’ll want to visit the general settings page to make sure everything is set up correctly. You can also change the standard email receipt, set up taxes, and modify miscellaneous settings. This won’t take too long to work through – the PayPal setup is the most important part here. To get your first download up, navigate to Dashboard > Downloads > Add New. This page conveniently resembles the ‘Add New Post’ or ‘Add New Page’ pages. It’s instantly familiar, and it makes editing a cinch. Underneath the text input field, you can set the price or option to enable variable pricing, which allows you to set payment options. If you enable variable pricing, you can also enable multi-option mode, which allows users to add more than one option to their cart. In the next box, you can easily upload the files to be downloaded. For example, if you’re selling an ebook, you’d upload the PDF here. Clicking ‘Upload a file’ will open the WordPress Media Library, and you can choose or upload a file at this point. If you’re selling multiple files, no problem. Just click the Add New File button. You can also order your files by clicking and dragging on the left-hand side of each file (a four-headed pointer should appear). If you need to remove a file, the button on the right-hand side of the file will instantly delete the file of your choice. The next box allows you to add Download Notes. This section comes in handy if you need to include special instructions with the download or if you simply want to leave a nice message with the user. The Excerpt box is optional, allowing you to add a sneak peek at your download. To learn more about excerpts, check out this Codex article. Navigate to the right-hand side of the page. There are four boxes left to tackle: Download Categories, Download Tags, Download Settings, and Download Image. In the Download Categories box, choose or create a category to organize your download. The Download Tags box is similar. This process is identical to categorizing a post with categories and tags. The ‘Download Settings’ box is a particularly important area to pay attention to. Here, you can set a file download limit, which can be useful for proprietary files. You also have an option to modify the purchase button. You can choose the call-to-action, and you can decide where it goes. If you leave ‘Disable the automatic output of the purchase button’ unchecked, the purchase button will appear at the bottom of the download. However, if you check it, you’ll need to copy the shortcode found in this box. You can insert this shortcode wherever you’d like, making this one of the more flexible options that Easy Digital Downloads affords you. Finally, use the Download Image box to set a nice picture on your download page. Once you’ve double-checked everything, hit publish. You’ve now got your first download up! An important note: On each download page, you can see the stats in the upper right-hand corner. The number of sales and total earnings are displayed here, and you can also check out the download logs if you wish. Easy Digital Downloads gives you a range of options to customize your downloads. If you’d like to see your payment history or take a look at who’s buying your downloads, EDD gives you the ability. Here you can view a full list of your sales. You can view the order details, see refunded/cancelled orders, and even keep track of failed purchases. This provides an alternative view of your customers, and you can also track each customer’s spend total. This nifty feature gives you the ability to add discount codes to any of your products. You can create a code name (like HALFOFF), choose a percentage-based or flat fee-based discount, and allow the code to work on any or all of your downloads. This convenient graph view displays your earnings over time. You can export your sales and earnings as a PDF or view the logs on this page by clicking on the respective tabs. We’ve just scratched the surface of what Easy Digital Downloads can do. You’re able to accomplish everything mentioned so far with the free version of the plugin, and on top of that, there are some extensions (some free, some paid) that are worth a look. These extensions add some great functionality to EDD. You can integrate it with your mailing list, offer pay-what-you-want pricing, accept other payment processors, and much more. A shortcode-based functionality that allows you to spotlight certain downloads. You can also modify the HTML if you wish. If you’re selling a service on your storefront, you need this extension. It’s a simple extension, but it refines the buying process for the user. This free extension is a must-have. Purchase Rewards allows you to reward customers with a discount code for future purchases. You can also require the user to share your site with at least one social network or set a minimum purchase amount that the user has to meet to obtain the discount. Zapier has become increasingly popular for its wide range of abilities. 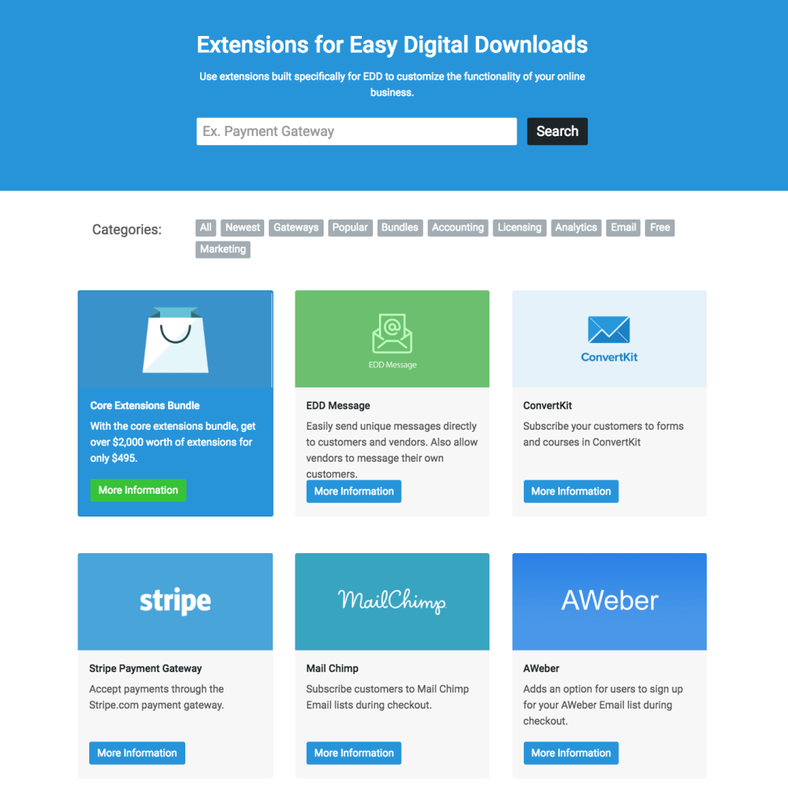 With this extension, you can integrate it with your EDD storefront. You’ll also get the ability to use over 400 third party services, like MailChimp, Zendesk, Dropbox, and more. Use this extension to sell recurring subscriptions on your site. You’ll get a range of billing options and support for Stripe, PayPal, and more. When a user shares one of your products on a social network, they get a discount. This simple yet powerful plugin will help you increase sales and spread the word about your brand at the same time. There are Easy Digital Downloads extensions for almost everything you can think of. Browse the full list here. Easy Digital Downloads might very well be the definitive plugin for selling on WordPress. When stacked up against its rivals like WooCommerce, it really excels in providing a streamlined way of selling downloads (and even physical products). If you’re selling downloadable products on WordPress, EDD is worthy of your foremost consideration.